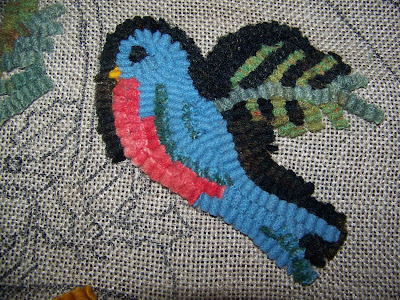 I'm having a lot of fun working on the December 2008 Rug Hooking Magazine free pattern with Gene Shepherd's Blog Hook-In ( http://www.geneshepherd.com ). The original pattern is a basket full of Christmas greens and a Noel ribbon, which is not really my kind of pattern, so I started out by following Gene's alternative tweaked pattern. 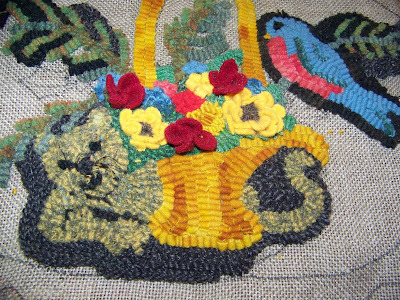 I hooked a bluebird, and then thought that a basket of flowers, even with a bluebird was not really my kind of pattern, so I added a cat slinking in from the opposite side. The cat really didn't look like a cat, so I asked Vicki of fanXstitch if she would draw a sort of evil cat for me. She drew a wonderful sly looking cat, but when I copied the drawing and translated it into hooking with size 8 strips, it didn't look evil and really didn't look much like a cat. Also, although it doesn't show much in the picture, the greenish/yellow tweed wool was definitely the wrong color. I shaped the cat face a little to give it some dimension and added some whiskers that were cut from a plastic bag I was saving for onion dyeing. Then I added some flowers, doing sort of freestyle mini-prodding, mostly with size 8 strips, although I tore wider strips for the bigger yellow padulas. I changed the cat to brown, kind of lost the face that I liked even though it was not sly, and kind of lost the whole point of having the cat. Today, I am either going to redraw the cat so he is facing in the opposite direction or eliminate him all together. 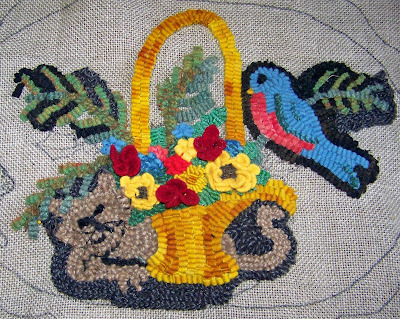 I like the basket, the handle, and the flowers, but the bird seems pretty dull and kind of extraneous - and will be especially if I delete the cat. 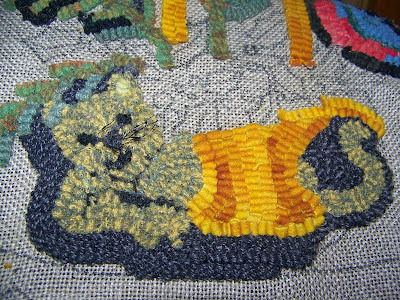 Plus, if I delete the cat, I'll have to hook in the left side of the basket and I really like it exactly like it is. Well, I'll see. I think I have to go out to the barn and find some plain gray wool for the new cat. No more tweeds. Your kitty looks great and I love your flowers. Thanks, I didn't catch your comment until today (2/19) -maybe if I had I wouldn't have let the dog chase the cat away!